We’ve been so busy – and stimulated by a barrage of new experiences – over the past week that it has been hard to find time to reflect on what we’ve learned during our field experience. We all want to make sure that our posts reflect the new connections we’re making and the sparks of insights into both India and our own fields of expertise, but the pace makes this quite a challenge. Nonetheless, Peter and I decided to take a few moments on the plane to Chennai to comment on one of the most significant intellectual experiences of the trip to date: our seminar with the History faculty at Jawaharlala Nehru University, India’s premier university. Despite the fact that courses were not in session, eight historians took the time to spend half a day with us giving brief presentations on Indian history and responding to our numerous questions. Our conversations continued over lunch and we gathered in small groups to find out more about the roles of historians in contemporary India. I hesitate to speculate how many of our colleagues would have been available for a similar meeting during summer break. This generosity– and the desire to engage in impassioned scholarly and political debates – has characterized all the academics we’ve been lucky enough to meet in Delhi. For me, one of the most interesting debates the JNU faculty addressed was the question of colonial legacies: in what ways did British colonialism shape the history of modern India? What is the relationship between colonialism and the challenges India faces as a developing nation? How do the forms of knowledge codified under the colonial system (from the significance and definition of caste, to notions of justice and democracy) shape the struggles of governing a heterogeneous democracy? These are all questions of central importance to modern Latin American history as well, so it was fascinating to hear how another group of intellectuals address them. Although they disagreed about the extent of these legacies, there was a general consensus that it would take a considerable amount of time for India to further improve its commitment to human development. All of the talks were truly outstanding. Well prepared, intellectually provocative and beautifully delivered but a few points stuck out. First, one of the scholars, clearly the rebel in the group, took a very different stance than the rest of his colleagues about the nature of post-independence India. Rather than viewing India as the world’s largest democracy and the years since 1947 as a steady process of nation building, he spoke of the story of independent India as the reestablishment of the Mogul and British Empires along new lines. The evidence for this was the presence in contemporary India of a highly centralized state, bourgeois social order, discriminatory language policies (in which provinces in the North have attempted to assert their hegemony by making Hindi the official language) and a police force that has not been reformed since the British left. When his colleagues later responded, they couldn’t dispute any of his charges with specifics but pointed instead to the fact that the centralizing/repressive processes that he described as Imperial were not uncommon in nation states. Some of his ideas seemed confirmed in my mind when for example when we saw in the midst of an unruly traffic jam in the predominantly Hindu Himalayas a Sikh police officer using a WWII vintage rifle to maintain order. (The British considered the Sikhs a “martial” people and used Sikh soldiers and policemen to control the other peoples of India). Also, on local news we’ve seen attention was given to the repression of armed resistance movements in India’s peripheral provinces, something one doesn’t hear about much in the Western media. The scholar also related his theories about India as empire to the violence at Gujarat, which he saw as part of a larger history of state violence that Nussbaum had unfortunately ignored. He called particular attention to the anti-Sikh riots of 1984 (facilitated not by Hindu right wing parties but the supposedly progressive Congress Party.) The Congress party – to his mind – would not be willing to investigate communal violence, even the violence at Gujarat, for fear of calling attention to its own bloody history. Another scholar spent a lot of time distinguishing between Chinese and Indian patterns of development. This was also one of the themes brought out in our seminar at the Indian Institute of Technology. Indian scholars do not want to be grouped with China. A political scientist at IIT pointed out that while current attempts to negotiate global environmental treaties placed China and India in the same camp, this was inappropriate. While India was, like China, developing rapidly, its industrial sector was much smaller. Consequently, the country was leaving a small carbon footprint given the size of its population. Moreover, most of the Indian economy, based on small-scale rural farming, was ecologically sustainable. A historian at JNU pointed to the fact that India’s economic globalization had been carried out by Democratic means over the course of decades rather than through authoritarian measures dictated by people at the top (as in China). Moreover, politicians of all parties had made sure that the growth of the last decade had not come at the expense of India’s poorest (also in contrast to China). How was this progressive development achieved? India possessed a stable democratic political culture that had its origins in the Independence movement and resistance to the British in the mid 19th century. It was shared by members of the elite and the common people. This democratic tradition stands in sharp contrast to what I’ve studied in Russia where neither the elite nor the common people share a commitment to democracy. 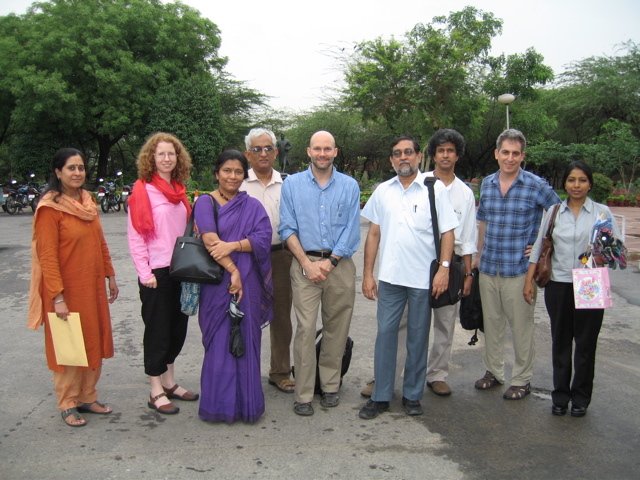 Most of us left the meeting feeling that we would see our colleagues at JNU again and that this meeting was the first step in a (hopefully) long-term collaboration. Several of us have already talked about joint projects.